cheap viagra 100mg worldwide shipping drugstore our grand festival. buy now This year our fun family festival is even more accessible with the addition of large parking areas, traffic control and shuttles to and from our grand event so, mark your calendar to join us the last full weekend in April in beautiful South Pittsburg, TN for the National Cornbread Festival. buy now Once you have entered the festival VISIT THE LODGE FACTORY STORE and purchase an item for pickup to get a 3rd street parking pass. The parking pass can only be used to pickup your item when leaving the festival. Festival Parking at 3rd street is strictly prohibited. Come Early! Most festival goers don’t know the gates are open at 8 a.m. The festival starts at 9 a.m. Get there early to avoid traffic. Peak traffic hours are 9:30 a.m. until about 2 p.m. Keep in mind, the festival closes at 6 p.m.
Visit the festival on Sunday morning. You can enjoy a pancake breakfast and church service. After your belly is full you’ll be able to enjoy all the sites and sounds without the large crowds. Check out our new online festival map. Keep moving. 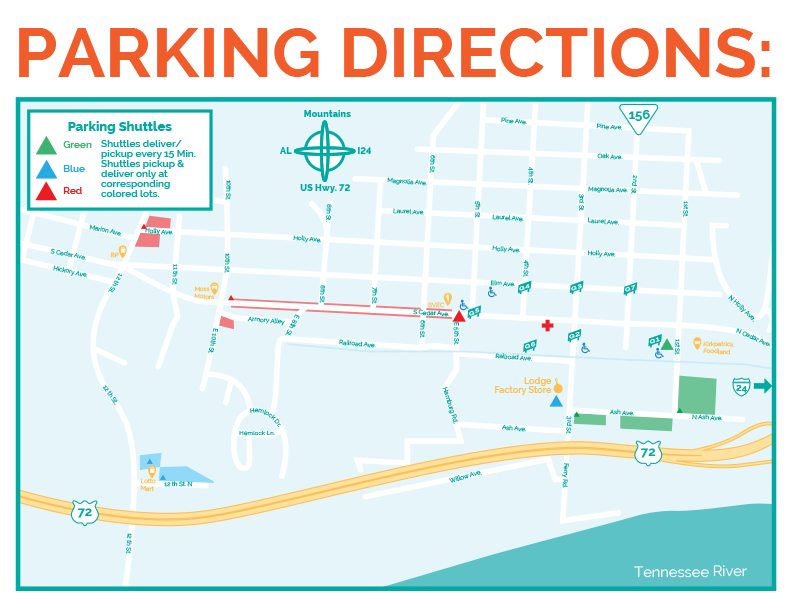 The helpful parking volunteers and TDOT signs will direct you to the best parking. Remember to relax. Yes, we are a large festival and that’s because festival-goers have a great time! We’re always voted one of the best festivals in the South. So, if you decide not to come early or on Sunday just relax and know it will take a little longer to park. Either way, you’re sure to have a grand time! then take the second right on 12th. To arrive safely at South Pittsburg, follow Interstate 24 to Exit 152, approximately 25 mi. west of Chattanooga. Proceed to Highway 72 west. After approximately 1.5 mi., bear right and follow the sign towards downtown South Pittsburg. From Huntsville, Alabama, continue on Highway 72 to 12th Street. Turn left and continue 0.5 mi. to the first stop sign (at the BP gas station). Turn right and proceed into town. This road will take you right to the festival. Look for parking areas as you approach. Handicapped Parking Areas are on 3rd Street and Cedar Avenue. Parking attendants are available for more information. Proceed south on US 72 for 2.5 mi. to 3rd Street. Stay left on US 72 when the bypass curves left and the New Hope South Pittsburg exit is to the right. Proceed to the first intersection with a traffic light (3rd street) with the business district sign pointing to the right. Drive 2 blocks to the railroad tracks. Cross the tracks. On your right is handicapped parking in the Walker Oil Company lot. Directly in front of you is an entrance to the festival with all activities within 3 blocks of your parking area. Proceed north on US 72 for 1 mi. to 12th Street (the first traffic light). If you reach a second intersection with a traffic light, turn around and go back 1 mile to 12th Street. Turn left on 12th Street. Your landmark on the left is a one-story building with a large, white “Physicians Care” sign. Proceed west on 12th Street for 0.5 mi. to Cedar Avenue. Turn right on Cedar Avenue. Drive north for 0.7 mi. to the parking area. Buses and Motor Coaches are asked to park in the lots on Cedar Avenue between 5th and 6th Streets to improve the traffic flow into South Pittsburg. Parking area is at the Carnival gate entrance to the Festival. The intersection has a green sign with the number 5 hanging in the intersection. You’ll find the lot one block from Citizens Park Stage and only two or three blocks from the Cook-Off, Cornbread Alley, or the Lodge factory tour. Parking attendants are available for more information. Proceed south on US 72 for 3 mi. to 12th Street. Stay left on US 72 when the bypass curves left and the New Hope South Pittsburg exit is to the right. Continue through the first traffic light intersection, ignoring the business district sign. Turn right on 12th Street (the second traffic light). Your landmark on the right is a one-story building with a large, white “Physicians Care” sign. Turn right on Cedar Avenue. Drive north 0.7 mi. to parking area. Drive north on US 72 for 1 mi. to 12th Street (the first traffic light). If you reach a second intersection with a traffic light, turn around and go back 1 mi. to 12th Street. Turn right on Cedar Avenue. Drive north for 0.7 mi. to parking area. You’ll find overnight parking without services for self-contained RVs at the State Line Flea Market Shopping Center. There are no services available at the shopping center and overnight parking is free. The Shopping Center on Cedar Avenue is 2 mi. south of the Carnival Gate entrance to the Festival. Turn left on Cedar Avenue. Drive south for 1 mi. to State Line Flea Market Shopping Center. Turn right into the center and park on the side of the paved area.